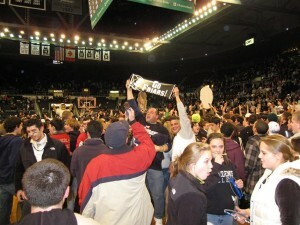 Normally, I would assume that most of you have seen the #1 team in the country getting knocked off, but thanks to some horrible TV scheduling only 2% (all numbers are estimates) of college basketball fans ended up seeing Providence beat Pittsburgh at the Dunkin’ Donuts Center (DDC) on Senior Night. 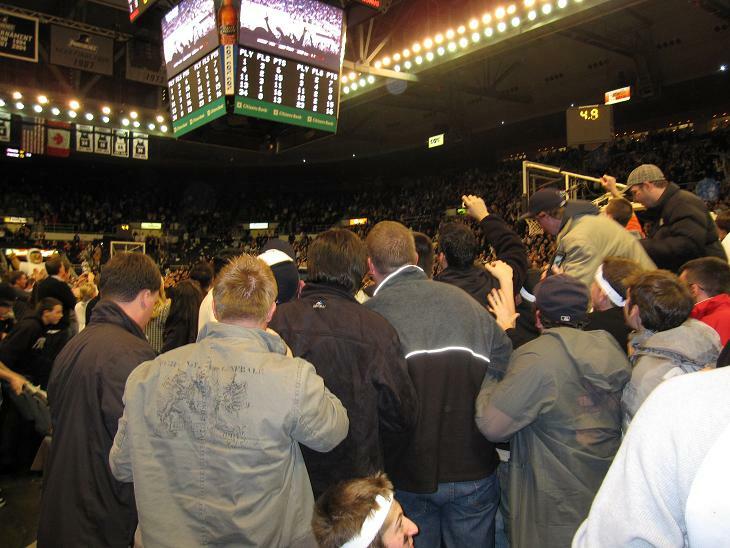 While the 11,187 in attendance and a few fortunate television viewers were able to witness what makes college basketball our favorite sport, we know that many of you were less fortunate. That’s where RTC Aftermath comes in. As part of our RTC Live coverage we answer questions from fans and also bring those questions to the players and coaches to answer. Last night, we were at the DDC for the fourth installment of RTC Live. 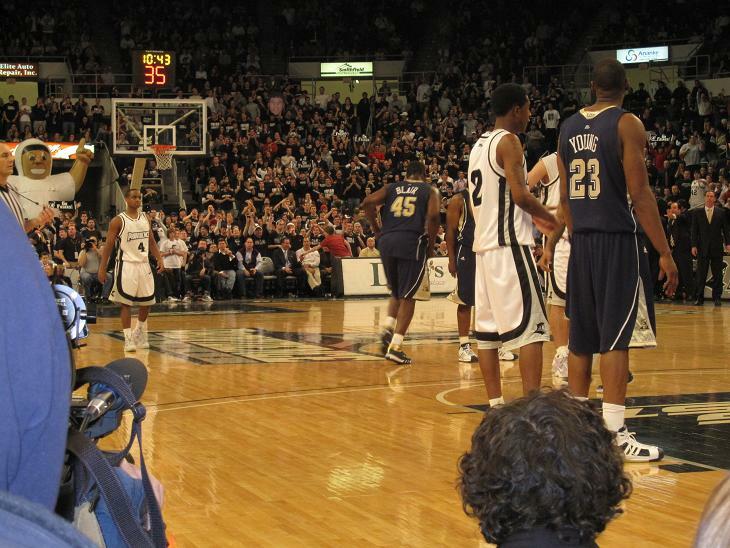 Our first three games (Wake Forest at Boston College, Miami at UNC, and Clemson at Boston College) were all solid games, but I don’t think any of them would qualify as memorable games from a pure basketball standpoint. 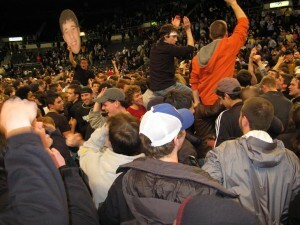 Being in the Dean Smith Center for an ESPN GameDay was a fun experience, but nothing like last night. 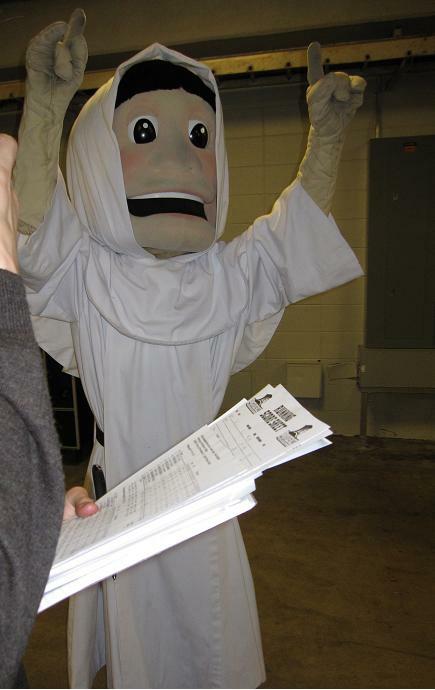 Pre-Game: The Friar fans (at least the ones in the student section) got there pretty early. The Friar fans were a lot more intense than I expected, but looking back on it I seem to remember some PC grads telling me that their student section was pretty crazy. 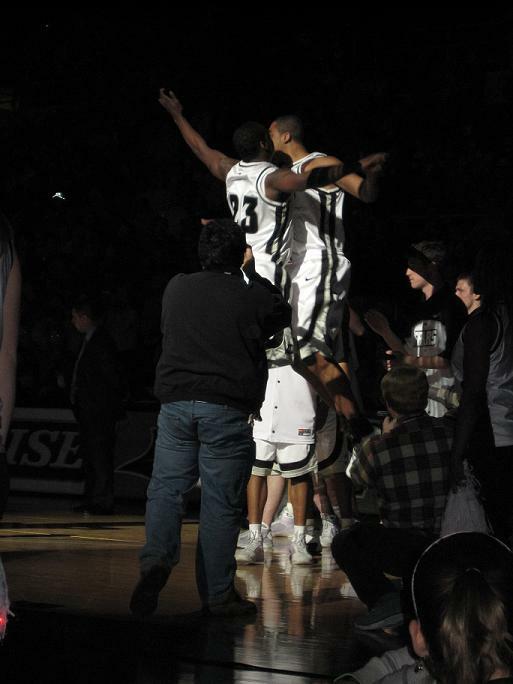 I think they were even more amped up than usual though because they were facing the #1 team in the country (even if the SportsTicker fax at the game still had them at #4) and it was Senior Night (something I wasn’t aware of until they started the ceremony). 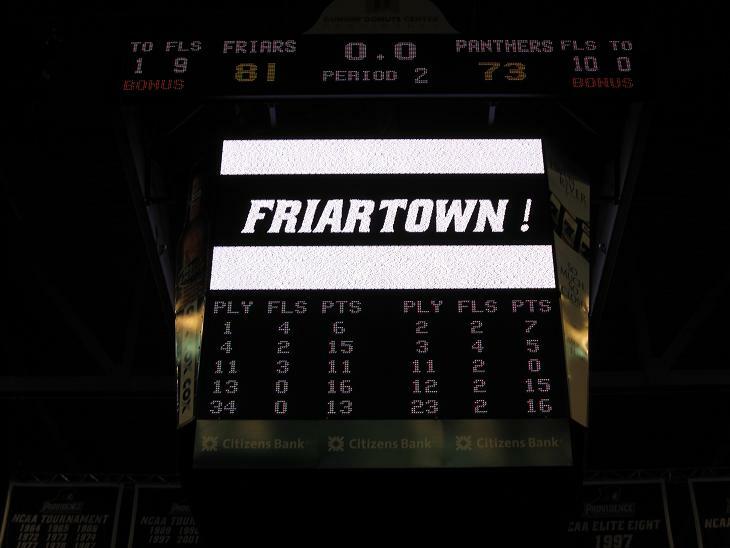 After the ceremony, which went on for quite a long time (8 seniors), the Friars and their fans made it clear pretty early that they weren’t going to go quietly on Senior Night. First Half: As I mentioned in last night’s After the Buzzer, the Friars got out to a quick start jumping out to a 15-4 lead after the first 5 minutes. The primary reason that they were able to do this was a strong opening 5 minutes by Jonathan Kale, who scored 6 points on 3/3 FG to open the game, and their ability to force Pitt into 5 turnovers that they converted into 9 points during that stretch. The Panthers were able to cut the lead to 6 with 5:01 left in the first half thanks to Ashton Gibbs who hit two 3-pointers, but the Friars then proceeded to blow the game open with 13-1 run to close the first half. At that point, the crowd and Rush the Court (who had thought that it might have been a mistake to travel over an hour down to Providence as opposed to 15 minutes down Commonwealth Avenue to the FSU–Boston College game) began to sense that something special might be happening at the “Dunk”. Second Half: Pitt was able to cut into the Providence lead (up to 20 just 17 seconds into the 2nd half) getting it down to a 10-point game with 13:50 left in the game. The Panthers were able recover from the awful ball-handing (at the 15:26 mark of the 2nd half they have 5 assists and 12 turnovers compared to Providence with 14 assists and 3 turnovers) and seemed to have the momentum, but that quickly changed with a little over 10 minutes remaining in the game when DeJuan Blair picked up his 3rd and 4th fouls in a 17-second span that sent the Friar fans into a frenzy. 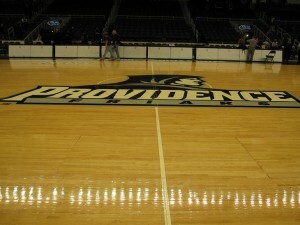 With the low-post player that they couldn’t match-up with out of the game, Providence was able to get the lead back to 17 with 6:30 remaining. The Panthers were able to mount a furious comeback that nearly silenced the rabid Friar fans after Blair tipped in an Ashton Gibbs miss to make it a 5-point game with 50 seconds remaining. The Friars managed to hold them off despite not making a field goal in the last 4:21 of the game thanks to a lot of trips to the free throw line (18-of-25 in the 2nd half). 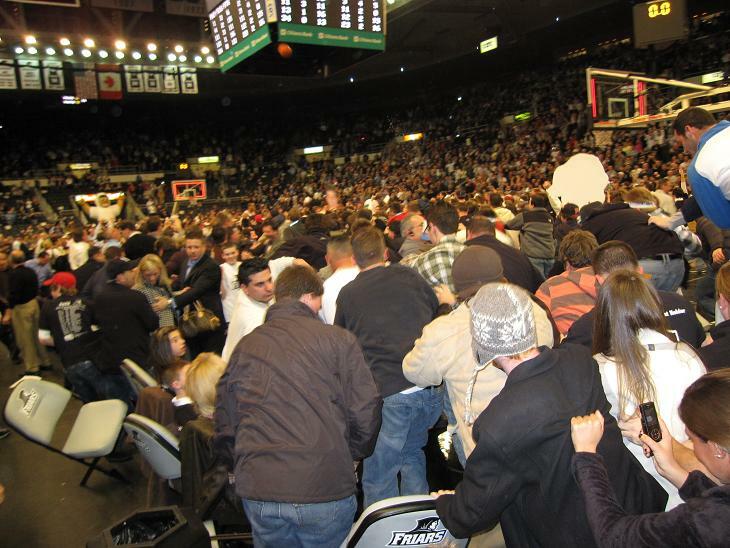 When you name your blog “Rush the Court”, you are expected to stay there (and possibly join in) when the fans rush the court. We managed to do just that (the only media entity to not run in fear, much less join in). Some of the better pictures are below (try rushing the court with a laptop in your hands sometime). If you have some pics, send them into rushthecourt@gmail.com. Pittsburgh never led in this game. They trailed from 44 seconds into the game and never managed to even tie the score after that point. 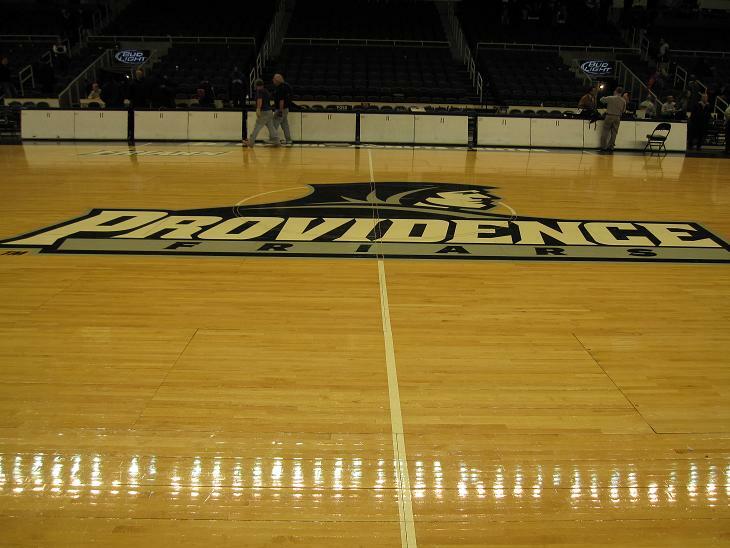 The turnover story: Pitt had 18 (with 12 assists) while Providence only had 9 (with 18 assists). Pitt’s 18 turnovers are its 2nd most this season in a game. Their high is 20 in their loss at Louisville (the last time they were #1). 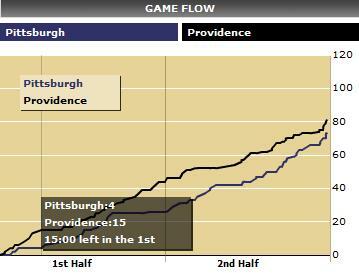 The FT disparity: Pitt was 12/15 from the line. Providence was 18/25 from the line in the 2nd half! They were 22/29 for the game. The Friars managed to only be out-rebounded by the #1 rebounding team in the country by 6 despite no player having more than 5 rebounds. Kale was huge for the Friars in the first half with 12 points, but only had 1 point after intermission. It’s not really a big surprise, but all 3 of Pitt’s losses have been in games that Blair has been in foul trouble. Rick Pitino made an interesting point on PTI yesterday when he noted that Blair has a tendency to reach on defense. Pitt isn’t going to develop another primary scorer in the time between now and the NCAA tournament so they will need Sam Young to be on top of his game when Blair has an off-night. Sam Young (16 points and 8 rebounds) and Blair (17 points and 8 rebounds) both had solid games according to the box score, but neither had the impact you expect from potential first team All-Big East players. Providence sent Geoff McDermott, Jonathan Kale, Jeff Xavier, Sharaud Curry, and Weyinmi Efejuku to the podium. Most of the answers were pretty routine. It was big to win on senior night, they didn’t think about some of the leads they have blown this year, they always believed they could win, they need to maintain their focus to get into the NCAA tournament, and the crowd was a big factor. As promised, I asked Efejuku about his thoughts on his career in the pros, which one of our readers asked about. He said that it’s really a dream. However, he’s focusing on finishing up the season, but a win like this definitely helps his changes of getting a shot at playing professionally. He was happy to hear that the Washington scout liked his game. 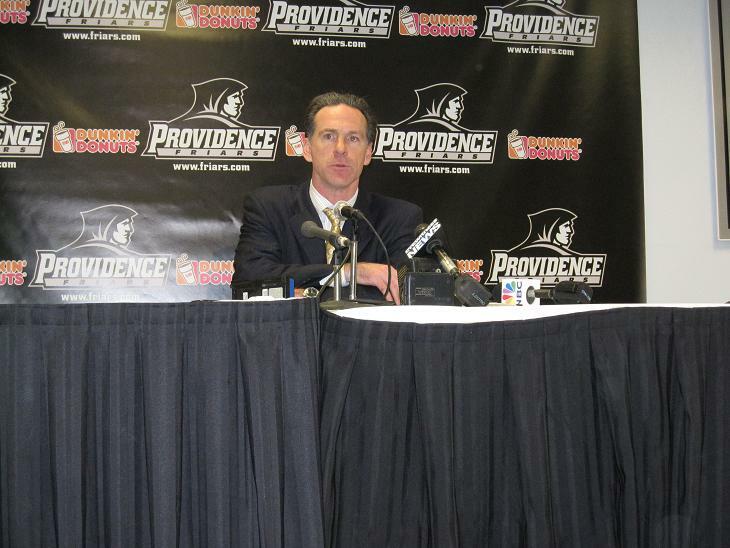 Jamie Dixon congratulated the Friars for the win, but wasn’t able to explain why his team played so poorly in the first half. He said they had a good practice leading up to the game, which makes the team’s performance even more baffling. He cited their turnover differential and free throw disparity as the key problems tonight. He did not blame the officials on the free throw disparity. Instead, he placed the blame on his team for the free throw disparity. Keno Davis talked about how proud he was of his team and how they finally put everything together tonight. 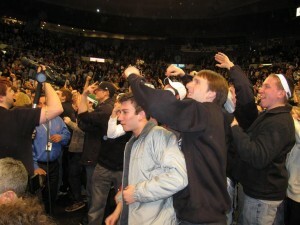 He spoke about the emotion of Senior Night along with the effect of the crowd and how well the team executed. He also complimented Blair on the fact that 17 points and 8 rebounds is a “down night” for him. He also spoke about how his team has overcome several tough losses this season and overachieved based on what the pre-season predictions were. DeJuan Blair was the most vocal person following the game. 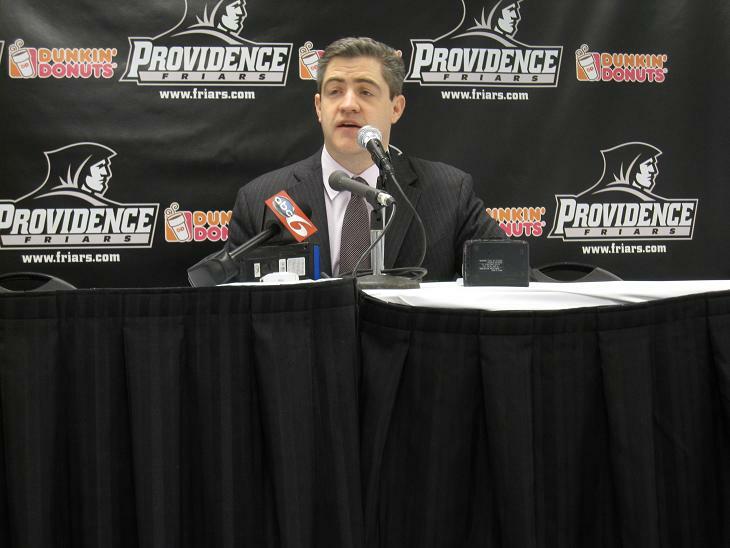 He repeatedly called his team “selfish” and that they “gave” Providence the game. We asked him what he meant by that, but he didn’t elaborate. He did not particularly worried about the loss (in terms of its long-term effect) or not being ranked #1 any more. He thinks the team will bounce back and can achieve its goals. True to our name we were the only media “outlet” that remained on media row when the fans rushed the court. We took a few pictures of the initial rush, tossed our laptop in our bag (the end of the live blog), and went out on the court to take part in the event. We didn’t see Jonathan Xavier at the game, but James Woods was reportedly there. One media member asked both the Providence players and Keno Davis about an 8:24 stretch where they didn’t make a field goal. At the time I thought he was paying a lot more attention to the game than I was even if it was a bit annoying to show it off like that. After looking back at the play-by-play, I’m pretty sure he was making stuff up because the longest stretch I could find was 5:41 (from 17:24 to 11:43 in the 2nd half). There were 3 NBA scouts (Washington Wizards, Minnesota Timberwolves, and the Dallas Mavericks) at the game. Washington was scouting the obvious suspects from Pittsburgh (Blair, Young, and Fields) and 4 players from Providence (McDermott, Efejuku, Randall Hanke, and Marshon Brooks). He didn’t seem particularly impressed with any of them although it may have just been me that he seemed uninterested in talking to rather than about the players. When he did talk to me he wasn’t as enamored with Blair as I would have expected after his emasculation of Hasheem Thabeet last week. He said Pittsburgh’s players (Blair and Young) were mid- to late-first round and nothing more. 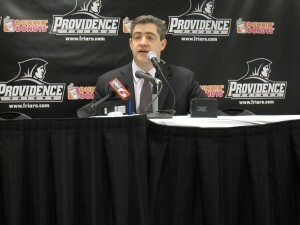 He also didn’t think there were any legitimate NBA prospects on Providence. He seemed to like Efejuku (“Will drive and pull up/Stroke looks good”), but not Brooks (“21′ range. Will penetrate. Lots of mistakes.”) I’m not certain on who Minnesota and Dallas was scouting, but I would imagine it’s roughly the same as Washington. This entry was posted on Wednesday, February 25th, 2009 at 3:37 am by nvr1983	and is filed under 08-09, RTC Live. Tagged: ashton gibbs, boston college, clemson, dejuan blair, fsu, geoff mcdermott, hasheem thabeet, jamie dixon, jeff xavier, jonathan kale, jonathan xavier, keno davis, louisville, marshon brooks, miami (fl), pittsburgh, providence, randall hanke, rick pitino, rtc aftermath, RTC Live, sam young, sharaud curry, unc, wake forest, weyinmi efejuku. You can follow any responses to this entry through the RSS 2.0 feed. You can leave a response, or trackback from your own site. Love the blog! 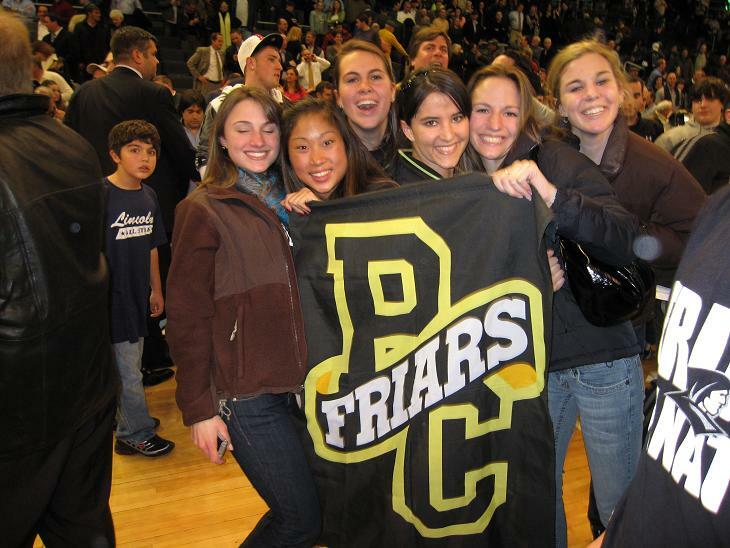 Love the ladies of Providence College photo. I was quite surprised to see that on your site as the one in the center is my daughter! The others are her friends and roommate. She is a freshman at PC, her sister is a senior, dad is an alum. This game was on her 19th birthday. She will never forget it!